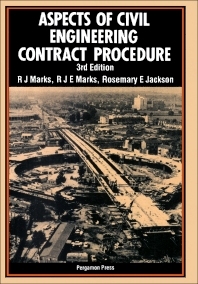 Revised and expanded, this book provides an up-to-date and comprehensive description of civil engineering contract procedures, and covers the whole spectrum of the legal, contractual and valuation implications of contracts for construction works. This third edition covers relevent English Law up to 1983. The extensive amendments also include a thoroughly revised chapter on overseas contracts, and a comparison of the JCT 80 contract with the ICE contract. Of interest to civil engineers, construction engineers, consultants and professionals concerned with contracts and their documentation, students of civil engineering, quantity surveyors and lawyers. Table of cases. Table of statutes. Introduction. Legal aspects of contracts. Types of contract and their standard forms. Preparation of the contract documents. Cost. Tendering procedure. Indemnities and insurances. Forfeiture, determination and frustration. Liquidated damages, delay and extension of time. Management and settlement of measurement contracts. Management and settlement of cost reimbursement contracts. Overseas contracts - finance and procedures. Appendices. Index.